Update: I plugged the numbers into Random.org and a winner has been chosen! The winner is comment #24! Rachel said, “I love eating it with granola for lunch.” So check your email Rachel! If the prize isn’t claimed within 5 days a new winner will be selected. Thank you for all of your entries! I’m sure that my recent lack of posts has made it pretty obvious that I’ve been in a cooking/blogging funk lately. I’m not sure if it’s the excitement of the baby or this cold weather that’s getting me down, but I just haven’t had a whole lot of creativity or motivation in the kitchen. It feels like I’ve just been rotating the same 5 meals lately. Needless to say, I was so excited when my friend Jessica, from My Baking Heart, invited me to join a Virtual Cooking Party! Perfect opportunity to get some excitement back into my kitchen!! 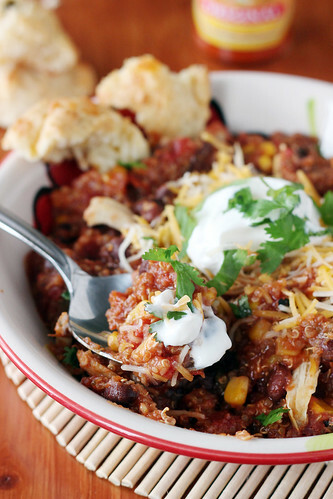 For this party we all put our own spin on the same recipe, featuring Stonyfield Greek Yogurt. 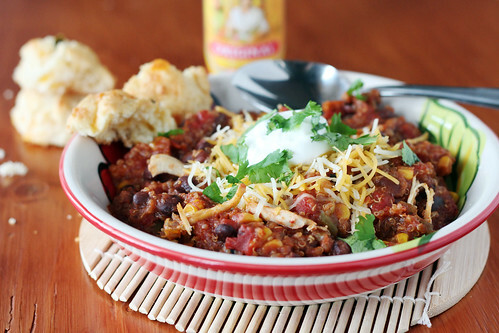 I am a HUGE fan of cooking with Greek yogurt, I often use it as substitute for sour cream in recipes and as a topping. I’ve even used it to replace the mayonnaise in a cole slaw recipe! 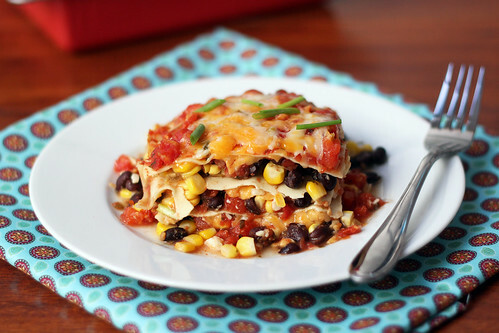 It’s a great way to make some of my favorite recipes a little bit healthier without making a sacrifice in taste. 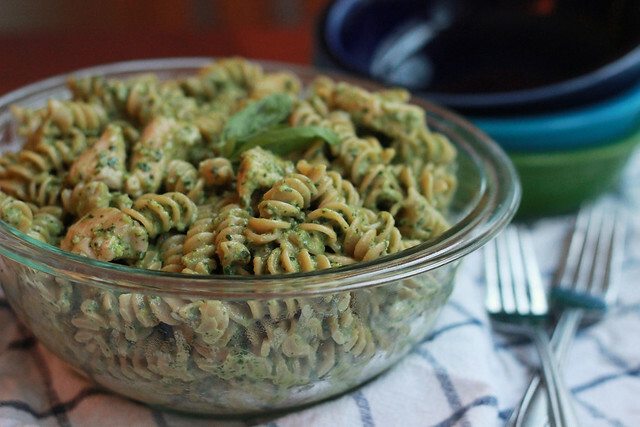 The recipe chosen for this Virtual Cooking Party was Spinach Yogurt Pesto Pasta. I love pesto because it is always so fresh tasting and it’s packed with layers of flavor. This recipe is no exception. I even told Jessica that I would happily just eat spoonfuls of this pesto for dinner. 🙂 But, since I live with a meat and potatoes man, I used pasta AND chicken. The chicken seemed to grab onto just the right amount of the subtle lemon flavor. 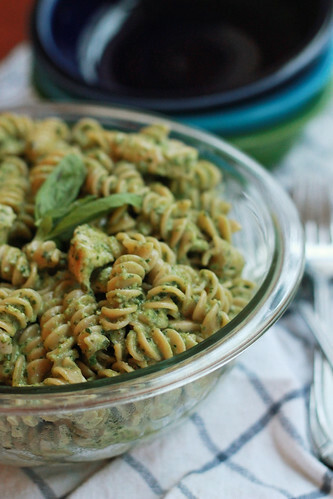 And as it turns out, the swirls of the rotini pasta made perfect pockets for holding on to the delicious pesto. I thought the Greek yogurt was the perfect way to add creaminess to the pesto. The slight tang of the yogurt perfectly balanced the fresh basil and powerful garlic. To help make dinner a little more economical, I substituted walnuts for pine nuts. All in all, dinner was a huge success! Big thanks to Jessica for bringing a fresh new recipe to my kitchen! 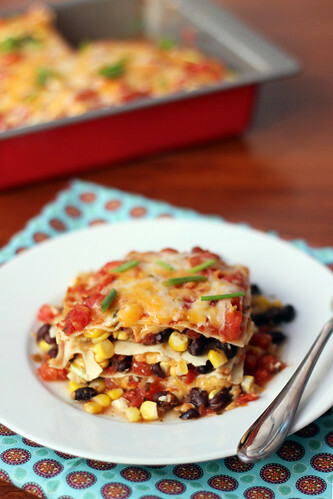 Be sure to stop by her blog to see how the other party-goers put their own spin on this recipe! For this party I was happy to get my hands on some free Stonyfield Greek Yogurt, and I’d love for you to be able to get your hands on some as well! Because what’s a party without a fun prize/giveaway?! Stonyfield has generously agreed to offer one lucky reader a case of Stonyfield yogurt and a Stonyfield Cookbook! The giveaway is now closed and a winner has been announced! Leave a comment telling me your favorite way to use Greek yogurt! 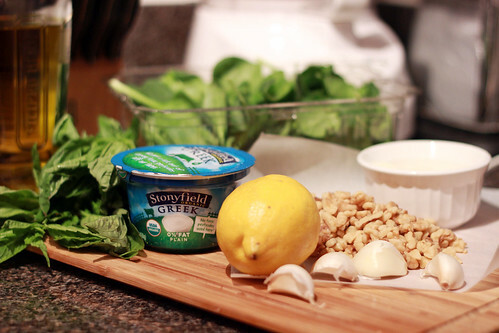 I was offered free Stonyfield Greek Yogurt as a part of this Virtual Cooking Party. However, the opinions and review are my own! *To toast the walnuts, add them to a dry skillet over medium heat and cook, stirring occasionally for a few minutes, or until they become fragrant (the nose knows). Careful not to over-toast them. Burnt walnuts are bitter! Combine garlic, spinach, basil, pine nuts, lemon juice and zest in the bowl of a food processor or a blender and process until finely chopped, scraping down the sides of the bowl once or twice. With the motor running on low, add olive oil in a slow, steady stream. Scrape mixture into a small bowl and stir in Parmesan cheese and yogurt. Season with salt and pepper. Cover with plastic and refrigerate for up to 3 days, until ready to use. Bring a large pot of salted water to a boil and cook pasta until al dente, following the directions on the box. Reserve a 1/2 cup of cooking liquid and drain the remaining liquid. While the pasta is cooking, heat a large skillet over medium-high heat and spray with non-stick cooking spray. Add the chicken and season with salt and pepper. Cook until the chicken turns golden brown and is cooked through, turning meat as need to cook evenly. 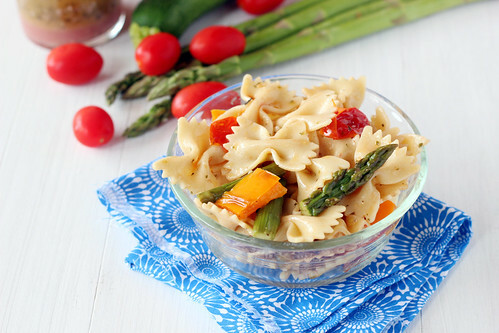 Add the cooked pasta to the skillet and toss with the yogurt pesto. 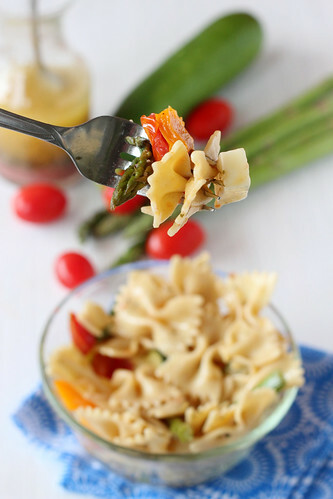 If pasta looks too dry, add reserved cooking liquid, 1 tablespoon at a time, to moisten. Garnish with extra lemon zest, if desired, and serve hot.